Could fighting climate change become a major development opportunity for Africa? 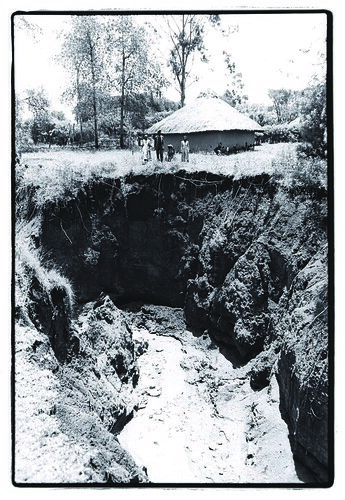 Naomi Nyangancha, Jennifer Ojwang and their (common) husband stand in front of their homestead in the surreal landscape of Katuk Odeyo, which bears the brunt of extreme soil erosion in Nyando District, in Western Kenya (photo credit: ILRI/Mann). Can we grow more food and feed more people and capture more carbon? 'Yes,' say those organizing an Agriculture and Rural Development Day held on 4 December 2010 in parallel with the Sixteenth Conference of the Parties (COP16) to the United Nations Framework Convention on Climate Change taking place at Cancún, Mexico. Yes—if we support the small-scale producers and sellers of food and acknowledge that climate security and food security depend on each other. Read a report of the Agriculture and Rural Development Day at the 'CGIAR in Action' blog: Opening the door for agriculture at COP16,' 7 December 2010. 'Yes,' agrees Alex Perry, a journalist writing for Time Magazine this week (13 December 2010). Yes—if we make green development work for the 7 out of 10 Africans living on small farms. 'Climate change is the mother of all negative externalities,' says Perry, who defines an 'externality' as a by-product of economic activity not included on the balance sheet. 'The problem is measuring it: How do you calculate the cost of climate change and then apportion it fairly among the world's businesses? Skeptics say rich governments and Big Industry can't or won't. Some, like Nicholas Stern, who produced the British government's Review of the Economics of Climate Change, say it can be done. But Stern's figures—which show that climate change could cut global gross domestic product by 20% if quick action is not taken—have been criticized as both over- and underestimates. And others argue that since climate change most affects the poor, programs to lift the developing world are the best way to fight its impact. 'But what if the externality could be accounted for, in a way that helped the poor? What if the economic rule book could be rewritten so that fighting climate change became development? . . . As a result of works by Sukhdev and others, UNEP [United Nations Environment Programme] executive director Achim Steiner can measure the financial benefits of saving the planet. New assessments indicate that "nature may represent between 50% and 90% of incomes in the developing world," he says. "In the past, these services have been invisible or near invisible in national and international accounts. This should and must change.". . .
'What is clear is the potential. "It is essential that climate change be viewed as a major development opportunity for Africa," World Bank managing director Ngozi Okonjo-Iweala said last year. 'And this is primarily a developing-world opportunity for two reasons. First, the poor world tends to be rich in things like forest and sunshine. Second, the rich world has few incentives to change its ways. "Suddenly there is the possibility of a whole new green trajectory for Africa," says UNEP spokesman Nick Nuttall. "You might ask, Can combatting climate change actually offer a new future for Africa?" . . .
Read the whole article at Time Magazine: Land of hope, 13 December 2010. The livelihoods of many of the world’s rural poor are increasingly threatened by climate change. 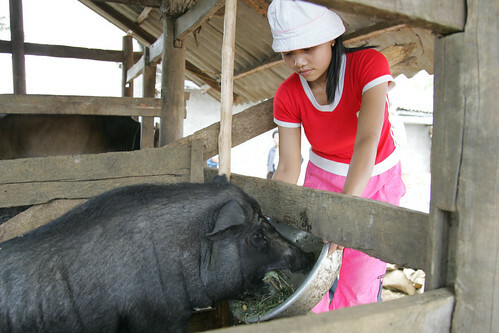 Most of these livelihoods are dependent on farming, fishing and forests. Climate change will affect and worsen the living conditions of people who are already vulnerable and food insecure, especially in developing countries. In the face of what seems an inevitable change, scientists are looking for solutions that will help poor smallholder farmers adapt their agricultural practices to cope with, and mitigate, climate change. Through a new Climate Change Agriculture and Food Security (CCAFS) initiative, a consortium of the Consultative Group on International Agricultural Research (CGIAR) is seeking innovative approaches to address the emerging threats to global agriculture and food security. CCAFS is a 10-year initiative launched by the CGIAR and the Earth System Science Partnership (ESSP). CCAFS works to diagnose and analyse threats to agriculture and food security, to provide evidence for development of climate change policies and to identify and develop pro-poor adaptation and mitigation practices that will benefit poor farmers and urbanites alike. In a CCAFS workshop held at the World Agroforesty Centre (ICRAF), in Nairobi, Kenya, on 4 May 2010, scientists and researchers held discussions on ways of ‘building food security in the face of climate change’. Among the key challenges to food security identified by the participants were: lack of a platform by which developing countries could share their experiences in dealing with climate change; weaknesses in presenting lessons from climate change impacts on farming; and inability to implement policies to address climatic risks to developing-country agriculture because of widespread poverty, limited human capital, and poor governance in many poor countries. According to Achim Steiner, the Executive Director of the United Nations Environment Program (UNEP), ‘Agriculture needs to be understood within the greater context of livelihood sustainability’. Steiner believes the threat of climate change offers opportunities for agricultural development if new innovative ways of enhancing agriculture are explored. For example, agricultural practices that help communities reduce carbon emissions should be considered. ‘If we can demonstrate that a farming or production system reduces emissions, communities could be paid to develop it for expansion to solve two challenges at the same time. ‘The future of agriculture is not just in increasing production,’ the UNEP head said, ‘but in having working systems that protect the planet and that benefit those who engage in practices that protect the planet and livelihoods of the poor. Thomas Rosswall, who chairs the CCAFS Steering Committee, noted that the ‘big disconnect [in addressing agricultural production] has been because development and global change have been addressed, researched and funded as unrelated issues’. He said ‘the approach to research needs to change so that it can link the local experiences to global needs while working with the poor to improve agricultural productivity. Participants of the meeting agreed that ‘transformative solutions’ are needed to address agricultural challenges in the world. These solutions, they agreed, need to work with, not against, nature and they need to address conflicts of interest among farmers, countries and markets. Researchers, they said, need to focus on plant breeding and improving soil fertility. And regional decision-makers need to integrate development and climate-based polices and strategies between countries. In many countries, agricultural productivity is already being linked to climate change. In Africa, for example, an African Bio-Carbon Initiative is working to reduce the impacts of climate change on the continent’s farmers while increasing and sustaining their agricultural production. In India, environmental studies show that climate change is creating opportunities for farmers to increase their vegetable production, and thus their incomes. According to David Radcliffe, of the European Commission, the CCAFS initiative will build understanding of the problems climate change is causing smallholder tropical farmers and will provide evidence for policies that can reduce these problems. 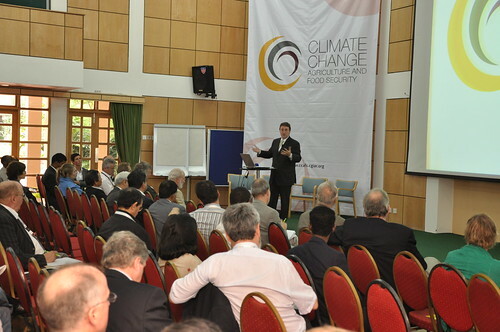 CCAFS will focus on climate hotspots. It will pilot methods to help farmers both adapt to climate change and reduce their production of greenhouse gases, which cause climate change. Both adaptation and mitigation methods, Radcliffe said, will be needed to feed the world’s growing population while using fewer resources. The John Vercoe Conference and seventh Peter Doherty Distinguished Lecture will take place at ILRI headquarters in Nairobi 8-9 November 2007. The International Livestock Research Institute (ILRI) Board of Trustees is pleased to announce the John Vercoe Conference and the seventh Peter Doherty Distinguished Lecture. 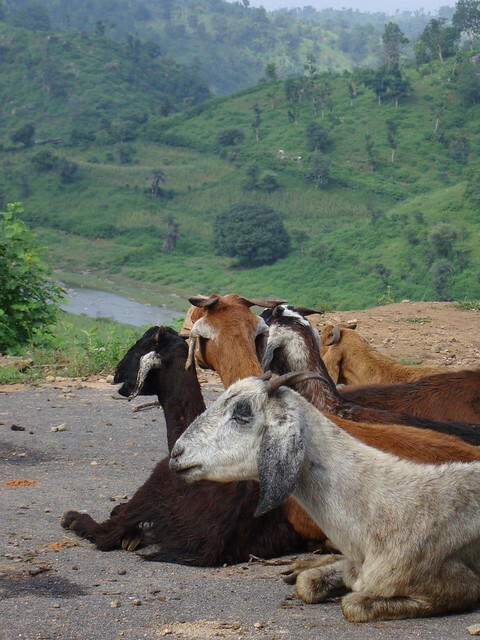 The conference theme is ‘Animal breeding for poverty alleviation – harnessing new science for greater impact’. The John Vercoe Conference will be inaugurated by the Kenyan Minister of Science and Technology, Hon. Noah Wekesa and thereafter, followed by the presentation of a keynote paper by Achim Steiner, Executive Director of the United Nations Environment Programme (UNEP).